The last load of clothes are tumbling in the dryer. My weekend has come to an end. There's a wonderful sense of satisfaction when all the tasks of the day are completed and I can start my week without any leftover "To Do's" and "Should Have Been Done's" tapping on my shoulder. 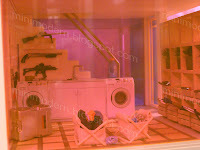 The sink and washer/dryer are from Theo Klein. 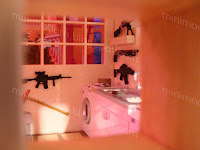 The storage unit is from the Dolls House Emporium. 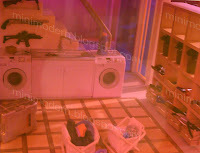 The laundry baskets are from Plan Toys. The laundry detergent is from Re-Ment. The weapons and weapon case are from an assortment of action figures that I have purchased over the years. 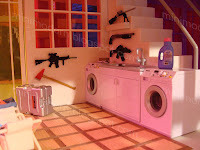 Very cool ... almost like an oxymoron - laundry and weapons. 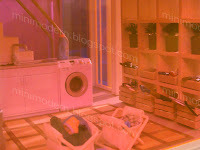 Ummm, is this the laundry room of 'Mr. & Mrs. Smith'? i love the weirdness of this set up! Don't screw with Mommy when she is doing the laundry!!!! hee hee hee! You just crack me up! This scene cracks me up - I've got to show Husband. He would love it. It looks like you're starting your own mini militia! You never know what you need on hand to be tough on stains. I guess that's one way to convince the kids to put their dirty clothes in the hamper. When I found this doll house, designed by Arne Jacobsen , I thought it would interest you ! I love the mini Egg, Swan and Serie 7 chairs !